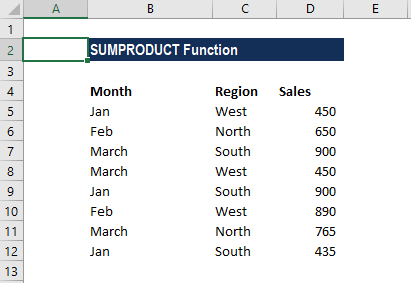 What is the SUMPRODUCT Excel Function? The SUMPRODUCT Excel Function is categorized under Math and Trigonometry functionsFunctionsList of the most important Excel functions for financial analysts. This cheat sheet covers 100s of functions that are critical to know as an Excel analyst. The function will multiply the corresponding components of a given array and then return the sum of the products. It is used to calculate weighted average. As a financial analystFinancial Analyst Job DescriptionSee a real Financial Analyst Job Description including all the skills, experience, and education required to be the successful candidate for the job. Perform financial forecasting, reporting, and operational metrics tracking, analyze financial data, create financial models, SUMPRODUCT is a very handy function as it can handle arrays in different ways and help in comparing data in two or more than two ranges. It also helps in calculating data with multiple criteria. Array1 (required argument) – It is the first array or range that we wish to multiply and subsequently add. Array2, Array 3 (optional argument) – d It is the second (or third) array or range that we wish to multiply and subsequently add. How to use the SUMPRODUCT Excel function? 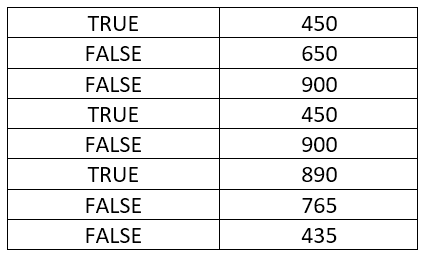 The reason we provided the double negative (- -) is to force Excel to convert the TRUE and FALSE values into 1’s and 0’s. The first array contains the TRUE/FALSE values that result from the expression C4:C12=”WEST”, and the second array is the contents of D4:D12. Each item in the first array will be multiplied by the corresponding item in the second array. However, in the current state, the result of SUMPRODUCT will be zero as the TRUE and FALSE values will be treated as zeroes. We need the items in array1 to be numeric, so we need to convert them into 1’s and 0’s. It is where the double negative comes in as it will treat TRUE as 1 and FALSE as 0. #VALUE error – Occurs when the arrays provided do not share the same dimensions. The SUMPRODUCT function will treat non-numeric entries that are part of the array as zeroes. SUMPRODUCT accepts up to 255 arguments in Excel 2016, Excel 2013, Excel 2010, and Excel 2007, and 30 in earlier Excel versions. Logical tests inside arrays will create TRUE and FALSE values. In most cases, it is advisable to convert them to 1’s and 0’s. 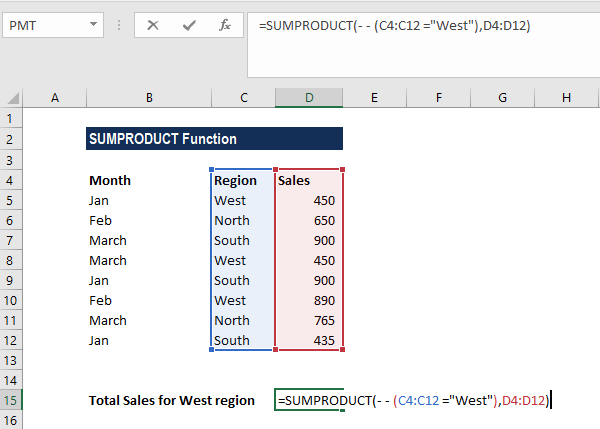 Two-way lookup in Excel – SUMPRODUCT formula helps look up a value at the intersection of a given row and column. 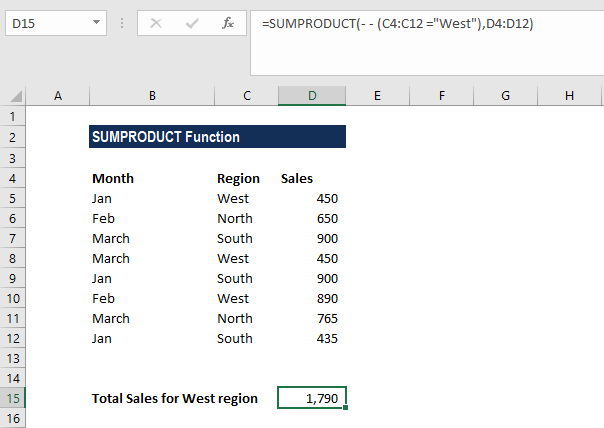 Count characters in Excel – SUMPRODUCT can be used to count the total or specific characters in a range. SUMPRODUCT for counting words in Excel – The function can be used to get the total number of words in a defined range or count only specific words. How to count distinct values – It can be used to find out how many different values appear in a range (unique plus first duplicate occurrences). Count duplicates and unique values – The SUMPRODUCT and COUNTIF functions help count duplicates and unique values in a column or between two columns. SUMPRODUCT and MONTH can be used to get a sum of values for a given month.